Delivery of cholera kits in Les Cayes, Haiti, after the area was ravaged by Hurricane Matthew. “The target population is estimated at 820,000 people over one year of age. Activities will focus on municipalities most vulnerable to cholera outbreaks in the two southern departments of Grand’Anse and Sud, where there have been significant destruction of water and other supply systems,” Mr. Dujarric said. In the release, PAHO-WHO Representative Dr. Jean-Luc Poncelet stressed the importance of the leadership of MSPP in this vaccination campaign. Some municipalities in the southwest peninsula have reported outbreaks of cholera since the hurricane hit on October 4, “so it is important to work together and with partners to build local capacity for clinical management of cases in the cholera treatment centres,” he said. Mr. Poncelet noted that PAHO-WHO will support the Ministry of Health in activities including development of tools and technical support as well as reception, storage and transport of the vaccines and supplies in departments, municipalities and institutions. “The vaccine is an additional intervention which will help us to save lives, but does not replace the efforts that the Government supports in the field of water and sanitation,” emphasized Dr. Daphne Benoit, Haiti’s Minister of Public Health. Earlier in the day, Alessandra Vellucci, the Director of the UN Information Service in Geneva, told reporters that as of 7 November, the appeal for Haiti was still only 36 per cent funded. 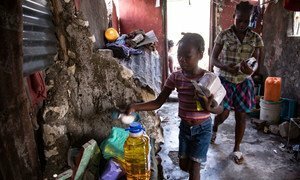 As Haiti struggles to recover from the massive destruction wrought by Hurricane Matthew, which pummelled the tiny island one month ago today, the United Nations warned that while its seems as if “the world has moved on,” Haiti’s needs are vast, exemplified by the nearly 600,000 children being stalked by disease, hunger and malnutrition and in need of assistance.